The Bank of England monetary policy makers, at its monetary policy meeting yesterday voted unanimously to keep interest rate unchanged at 0.50%, while maintaining the central bank's QE at 375 billion GBP. Weighing in on next week's EU referendum vote, the Bo said that the vent poses the largest immediate risk facing the UK financial markets and possibly global markets as well. The central bank warned that a vote to leave the EU could materially alter the outlook for UK's output and inflation. 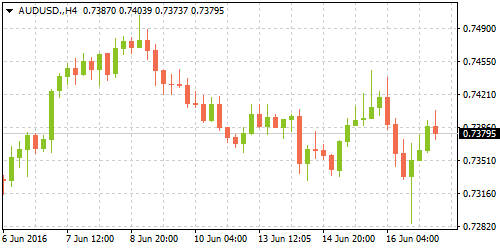 Australia's unemployment rate was unchanged in May, at 5.70%, data from the Australian Bureau of Statistics showed on Thursday. The unemployment rate matched forecasts. On the month, the Australian economy added 17.9k jobs in May, rising above forecasts of 15k jobs. However, April's job numbers were revised lower to show a net job gain of only 800 jobs on the month, down from 10.6k jobs as reported previously. The new jobs came mostly from part-time workers, which increased from 19.1k from the previous month. Full time jobs were flat, after falling 18.2k in April. Australia's labor force participation rate was at 64.80% in May, unchanged from April. Retail sales in the UK rose more than expected in May, data from the UK's Office for National Statistics showed on Thursday. Retail sales edged higher, rising 0.90% in May from April. It was a faster than expected pace of increase as analysts expected to see a 0.20% increase on the month. However, the month over month increase in retail sales was slower, compared to April's 1.90% jump. Consumers spent more on clothing and footwear during the month. Retail sales excluding auto fuel jumped 1.0%, beating forecasts of a 0.30% growth, but again it was slower than April's 2.0% increase. On a year over year basis, retail sales is up 6.0% in May compared to 5.20% in April, marking the fastest pace of increase since September and rising above forecasts of a 3.90% increase. 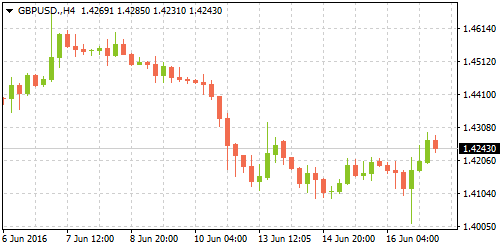 The Swiss National Bank, at its monetary policy meeting yesterday left the 3-month LIBOR rate unchanged at -0.75% while maintaining the target rate at -1.25% and -0.25%. The central bank said that negative interest rates the bank's willingness to intervene in the currency markets was making the Swiss franc a less attractive option for investors and thus it is expected to ease pressure on the currency. 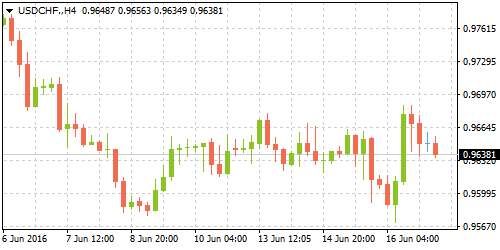 However, the SNB said that the Swiss franc was still overvalued and that the bank's policies were aimed at stabilizing price developments and supporting economic activity. The SNB also upgraded its growth outlook. On inflation, the SNB expects to see a negative print of -0.40% for 2016 while expecting inflation to rise 0.30% in 2017. For 2016, the SNB expects GDP to grow between 1% and 1.50%. Consumer prices in the US increased a modest pace in May, data from the US labor department showed today. 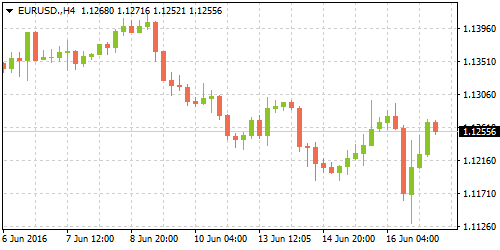 According to the data, CPI increased 0.20% in May, moderating after rising 0.40% in April and lower than forecasts of 0.30%. Excluding food and energy, the core CPI increased 0.20% matching estimates. Consumer prices grew at an uneven pace in May. Energy prices were up 1.20% but food prices fell 0.20%. Shelter costs were up 0.40% while apparel prices gained 0.80% on the month. The overall CPI was 1.0% higher in May, compared to a year ago but below the 1.10% increase seen in April. Excluding food and energy, inflation was up 2.20% on the year in May.